"We are the rainbow bridge between the worlds"
Our auric field or electromagnetic field is generated by the spinning of the chakras. As it spins, each chakra produces its own electromagnetic field. This field then combines with fields generated by other chakras to produce the auric field. An individual's auric field is manifested via a combination of energies from three chakras. 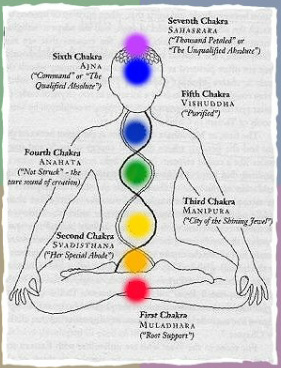 Generally these are the first, third and fifth chakras, empowering the physical, intellectual and etheric bodies. It is a combination of these three chakras that produces the primary auric field (the inner shell of the aura) which can be physically felt by the hand as it is passed over another's body. If one is sensitive enough, the secondary auric field (the outer shell) can also be felt. This secondary aura is produced from the interaction of all seven chakras. The spinning of the individual chakras creates energy, the frequency of which determines the colour of a particular chakra. The amount or intensity of energy produced by a particular chakra or group of chakras determines the colour that dominates the auric field. Vibration, colour and sound are all interrelated, and all three represent a means of determining or monitoring the frequency of energy in the auric field. An aura photograph, showing also the chakras (from the electromagnetic field of the subject). "The 'Word' that God sends into this turning age is metaconceptual, telepathic, both more comprehensive and more specific than linguistic terms. This is the ‘Living Word' of which you have scriptural mention, the luminous living information that inspires those who receive it and nurtures those who welcome it into their lives. In a literal as well as a spiritual sense it is the staple foodstuff, the nourishment of the coming age. It flows outward from your heart to nourish you and all included in your love. It is the understanding of life itself, providing you, from within, with a quality of individuality that will complement the world around you. The living information is inseparable from your life force. Biologically, you have experienced the animation of your life force, but you are not truly incarnate until you allow this current into your conscious awareness. Biologically, this energy is the centre of your life. As you also allow it to become the centre of your consciousness, your emotional realm is activated as an instrument of perception. Just as the eye is designed to sense and interpret certain frequencies as light, and the ear is designed to sense and interpret other frequencies as sound, the human emotional realm is designed to sense and creatively interpret the motivational, life-bringing energies that radiate throughout the universe. When you move beyond the vision prisons of historical definitions and release your heart to love, a superbly crafted etheric antenna unfolds from the luminous envelope that surrounds your body in light. This antenna behaves like a sensitive plant. When the heart is anxious, when emotions are troubled or turbulent, it remains closed. But when the heart relaxes in love, its delicate gossamer flowers unfold, like a tree coming into bloom, providing you with a sophisticated etheric organ designed to receive the information that circulates in the universal sea of Being. The seven flowerlike disks of the etheric antenna are anchored in the glands of the endocrine system. These glands bridge spirit and matter. They are the biological receptors that translate the higher-frequency information picked up by the etheric disks (the chakras of yogic tradition) into language the nervous system can recognize. They are designed to audit ultrafine frequencies, bringing both sensory and what some would call extrasensory impressions into your awareness. The etheric antenna is damaged by violent emotions such as anger or hatred. It is never in any danger from outside emotions, only from your own. It can remain open for months even in the midst of violent emotion, as long as you remain calm and continue to feel love for those around you. However, when your love is withheld, your etheric antenna closes, and then there are no shortcuts. Your heart must be returned again to God; it must resume the expression of love. And even then, time is required before your etheric antenna's full sensitivity is restored. The fully activated human sensory system is synonymous with your spirit's presence and occupies the same space. It extends beyond those portions of it whose vibratory rate is slow enough to attract the molecular structure of your nervous system. Its spatial reach extends outward from the physical body to include a larger vibratory field, of which the etheric antenna is but a part. From the spinal trunk the branches of the nervous system reach throughout your body, nurturing the many tiny leaves that are its cells. Its uppermost branches flower into the threefold petals of your human brain. When your love extends to include enough of your world to admit the vision of eternity, you will feel its blossomlike sensors unfolding, blooming to bring you more complete awareness of the multidimensional reality in which you live. Yet the fully activated human sensory system is more than just an interdimensional communication device. In miniature it replicates in the structural pattern of its biogravitational field the same pattern found in planetary, solar, galactic and universal fields. Activated, as it is for all those in an awakened state, it is capable of bringing through its own miniaturized circuitry the awareness of the archangelic beings who overlight each of these spheres. Through it, incarnate ones are able to access an experience base and system of informational exchange common to all universally conscious beings, drawing upon a shared pool of wisdom - and knowing it as their own. For behind their subjective roles and specialities, all conscious entities share a common field of being. They experience the various individual foci in the sea of that being not as others but as features of their own universal wholeness. Just as the latticework of galactic love, which holds this cluster of stars suspended, is mirrored above in the vibrational circuitry of this solar system, and then mirrored once again in the awakening circuitry of planetary intelligence, on a smaller scale this same basic design pattern - of eternal love - is mirrored in human biology, thus providing us with universally compatible systems for the habitation, enjoyment and continuing creation of these phenomenal realms."